Kit fits several carburetors, but the air cleaner to carburetor gasket does not fit the 6150 SA (early 2 bbl). 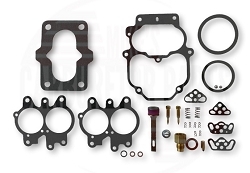 The original gasket is +/- 2.65" ID, 3.2" OD and 0.135" thick. The one in this kit is +/-4.2" ID, 4.85" OD and 0.06" thick which I believe will work on the later 2 bbl. I was very careful and removed the original, but will place an order for its replacement. Otherwise completely happy with the kit and service. 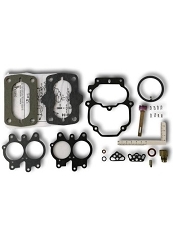 Great kit, every thing was right, except it relies on your taking your old carb apart, and every gasket, seal, and parts, is intact. 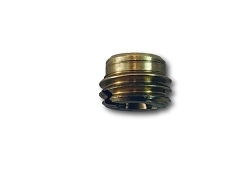 There are round seal/gaskets, that could fit in a couple of places, but aren't identified, as to where they should go. Some of these items had disintegrated, so AI had to guess which ones would work best. 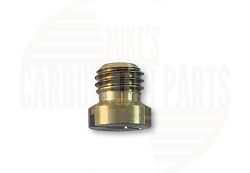 There was an air filter flange gasket for a different series carburetor, but not mine. No big deal, easy to make, but assumed it would be in the kit, as there is one that looks like it is meant for that position, but isn't. Overall, great kit, and fast delivery. R&D of latest up to date materials, substantially eclipsing OEM. Exceptional attention to detail. Generous inclusion of needed spare parts/kit. Stirling customer service. Family run business. AAA+ one on one support. Extensive knowledge base. The old Power Wagon purrs! Many thanks folks. Perfect. Just what I needed. Got to me quick. Q: The K457 kit looks the closest to the Carter carb on my Australian 1976 F100 with a 302 Cleveland motor, there is no numbers on the carb, would you know if this would be the one? Q: When do you expect to get the kits in stock? Q: But this kit for my 73 Duster two-barrel Carter. Top gasket between the fuel bowl and a top plate seems to be thin I feel like I'm getting leakage there any suggestions?